(ii) Diploma in Elementary Education / Diploma in Teacher Education / D.T.Ed. (iii) Teacher's Eligibility Test (TET) Certification. 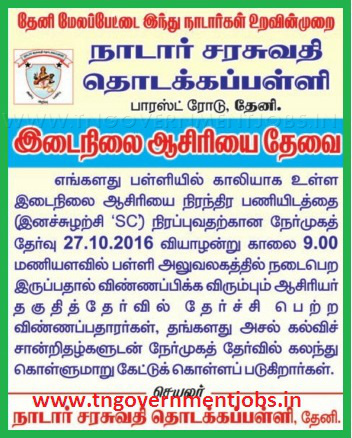 Interested eligible candidates may attend the walk in interview along-with all original certificates to the Secretary, Nadar Saraswathi Primary School, Forest Road, Theni District Nadu on 27th October 2016 at School Campus.